HUD Lottery Homes - HUD King tours 4838 Bill Anders Dr. 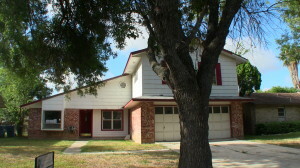 In this post we have a Texas HUD Lottery Homes at 4838 Bill Anders Dr., San Antonio, TX, 78219. This home is currently listed under the HUD Lottery program until 9/4/2014, meaning that ONLY Non-Profits and Government Agencies can submit offers to buy, and they get a 40% discount on the price! They actually can buy this home for $42,000, even though it's listed for $60,000. Now if no "Lottery" buyers submit an offer then it will go to the general public at the $60,000 list price. The home had 4 bedrooms, 2 full baths, and a nice big second living area/game room upstairs above the garage. It will need some TLC in the way of exterior siding, interior painting, flooring and some wall repair but considering it's appraised for $39,000 ABOVE the list price, I still think this could be a good buy for someone. There's even an FHA loan where you can borrow the money to do the repairs. If you're interested please contact me ASAP. HUD will pay 3% of your closing costs. There have been some tremendous savings on HUD Homes lately so if you are looking for a home to live in or some houses to pick up as an investor, now is the time to buy. All HUD Homes are time sensitive so you need to call me as soon as possible to discuss your buying options. Did you know that on some HUD Homes, HUD will loan you money to do repairs? Take a look at the video and see what you think, or search my webpage for other Texas HUD homes in your area. t’s as easy as entering a Zip code in the “Search Site” space to the right of this post. FHA Case# 495-310814. ← Previous Previous post: Texas HUD Homes – HUD King tours 307 Cresham Dr.